It’s Sharpe James versus Joseph DiVincenzo on…the tennis court? This Saturday, September 27, the Weequahic Park Sports Authority will host a "Tennis Family Fun Day" at the park near the Elizabeth Avenue and Lyons Avenue entrance. 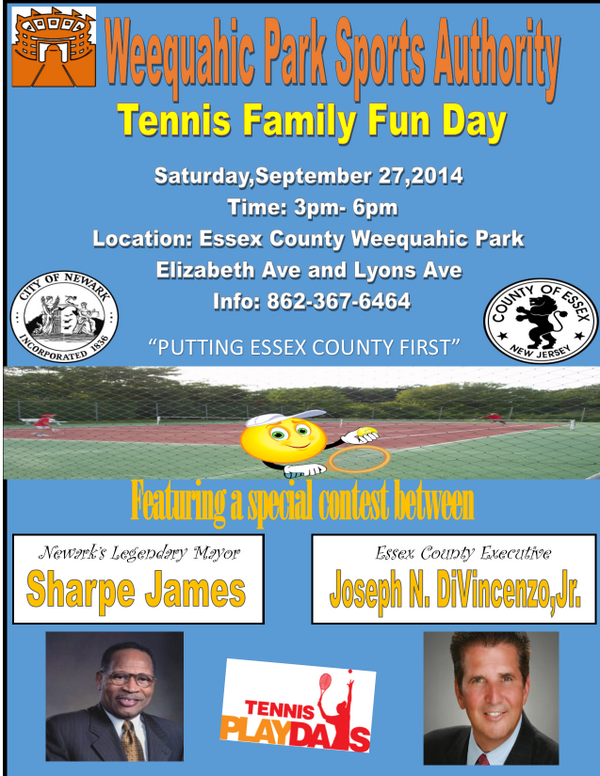 A flyer touting the event, which will run from 3pm to 6pm, also teases a "special contest" between former Newark mayor Sharpe James and Essex County Executive Joseph DiVincenzo, Jr.
https://brickcitylive.com/wp-content/uploads/2014/09/tennis-ball.jpg 565 849 Andaiye Taylor https://brickcitylive.com/wp-content/uploads/2018/07/Brick-City-Live-Logo-White-Red.png Andaiye Taylor2014-09-23 13:02:332014-09-23 14:04:17It's Sharpe James versus Joseph DiVincenzo on...the tennis court?